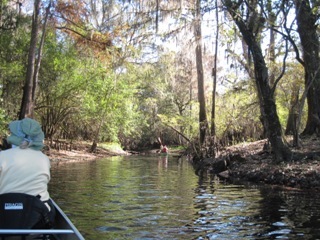 Bell, FL--Thanksgiving weekend each year sees the Fellow Traveler gamble on the weather and assemble a crowd for a late fall paddle. 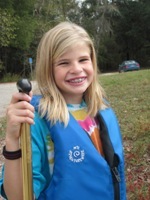 This event usually draws families and children so plans are always made for an easy paddle. 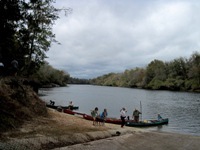 The 2010 excursion called for putting in at Wannee Landing on the Suwannee near Bell, canoeing on Friday to Hart Springs Park for camping, and paddling to Otter Springs Park on Saturday. Paul Tolar, Matt Gould, Eric Gould, and Chloe Gould met at Charlie and Diane’s house to make the trip. Matt followed Charlie, Diane, and Paul. The travelers left Moultrie about 5:40 Am and headed south. The first stop was at Akins’ Barbecue in Bell where everyone enjoyed a cheap and delicious breakfast. Art and Janice Shelfer arrived just as breakfast was completed and followed th e others to the meeting place at Hart Springs. Greg and Sean Ferrell were already there, as were John Williams, Joel Everett, and Chance Everett. The Moye clan--Roy, Dave, Eric, Brian, Sarah, and Katie, arrived shortly. Some of the travelers pitched tents in the campground before everyone journeyed to Wannee Landing to launch the canoes. The temperature was on the chilly side but it was not really cold. The vehicles were then shuttled back to Hart Springs and John brought the drivers back to the put-in. The paddlers were on the water shortly before eleven. Paddling was smooth. It took about an hour to reach Eula Landing, the spot where the paddle had begun the previous year. It was a good stop and the group decided that it was the appropriate place to eat lunch. There was a large friendly dog there and Diane’s Yorkie, Ami, did not seem to mind the competition for affection. A gentle rain began to fall just after the group got back on the river. It was not a hard rain but the canoeists did put on rain gear. There was a short stop for some at Turner’s Landing. The trip continued uneventfully. The rain came and stopped a few times but it was never a hard downpour. The canoes got to Hart Springs about one-thirty. The rain had ceased and the sky as a beautiful blue. Donald and Gloria May were there to meet us along with Gloria’s parents, Preston and Joy Bell. Those who had not set up their tents did so and it was then a time for swapping lies and enjoying the company. It would be a while before time to prepare supper. Charlie ran afoul of the rules, but unintentionally. There is a no pet rule but he thought it applied to the area around the spring. Ami caused a problem. To make matters worse, the rule about cooking inside the shelter was not understood. All cooking was supposed to be done outside and it was not. Mr. Gentry, the park superintendent, was very nice about everything. Roy prepared the supper of dirty rice. Charlie had neglected to bring the necessary onions and peppers so Diane and Janice drove to Trenton to get them. It was about dark by the time supper was eaten. Greg Baker came to eat supper and breakfast but did not canoe. Art baked a poppy seed cake in his Dutch oven and John cooked a pineapple upside-down cake in his. After supper and cleanup the campers sat around the campfire drinking coffee and sharing stories. Someone had brought enormous marshmallows and the youngsters enjoyed toasting them over the campfire. The May group left and did not spend the night. Eventually everyone went to bed. It rained twice during the nig ht, and one was a real drencher. No one got wet, though. Charlie got up and had the urn of coffee ready to drink by about seven. The campers one by one got out of bed and got ready for the usual breakfast of scrambled eggs (yellow this time), sausage, grits, and canned biscuits baked in a Dutch oven. Greg ran the shuttle to Otter Springs and then left. The morning paddle started around ten. It took less than an hour and a half to reach the spring run to Otter Springs. The spring run is shallow and there are a few obstructions but none which required leaving the canoes. The canopied trail is really pretty and the water is sufficiently clear so that any fish or turtles there can be seen. The trip ended about eleven forty. The canoes were loaded onto the trailer and vehicles. Joel became rightfully disturbed about the way the canoes are loaded onto the top rack of the trailer and he called to suggest a stepladder be used to avoid falls. His advice will surely be heeded.